Locate the HS_ERR_PID crash log. It is usually on the desktop, but can be placed in other locations too. and it still happens. Below is my hs_err_pid followed by my consol report. any help would be great. PATH=C:\Users\Jay\AppData\Local\Google\Chrome SxS\Application;C:\ProgramData\Oracle\Java\javapath;C:\Program Files\Common Files\Microsoft Shared\Windows Live;C:\Program Files (x86)\Common Files\Microsoft Shared\Windows Live;C:\Windows\system32;C:\Windows;C:\Windows\System32\Wbem;C:\Windows\System32\WindowsPowerShell\v1.0\;C:\Program Files\Intel\WiFi\bin\;C:\Program Files\Common Files\Intel\WirelessCommon\;C:\Program Files\Lenovo\Bluetooth Software\;C:\Program Files\Lenovo\Bluetooth Software\syswow64;C:\Program Files\Broadcom\WHL\;C:\Program Files\Broadcom\WHL\syswow64;C:\Program Files\Broadcom\WHL\SysWow64\;C:\Program Files\Broadcom\WHL\SysWow64\syswow64;C:\Program Files (x86)\Windows Live\Shared;C:\Program Files (x86)\Skype\Phone\;C:\Program Files (x86)\NVIDIA Corporation\PhysX\Common;"C:\Program Files\Java\jre1.8.0_66\bin"
>>> LoginFrame queue entry exiting. >>> Launch queue entry exiting. The crash is happening in the INTEL graphics driver. If you have a laptop with SWITCHABLE GRAPHICS (ie, intel + nvidia/radeon), let me know as there is a better solution in that case. You';; want to go to your nvidia/tradeon control panel and tell it to always use the high performance card (ie, radeon/nvidiia) and never use the power saving. I can give pictures if I know what you have. 1) DRIVERS: GO to Windows Devoce Manager > Display Adapter - rightclock PROPERTIES / DRIVER> I want to know the exact NAME of the intel adapter and also the DRIVER DATE. Next, never trust windows as it says you have the latest driver even if there are tons of better newer drivers from Intel. Afterwards, check the driver date and confirm whether it changes. In some cases you may have to restart the computer. the ones in red are MOST IMPORTANT to avoid crashes but the others will help too to make the game run faster. windows resizeable 800x600 will probably look too small but just let it fully load then expand the window using the min-max icons in upper right. Disabling GLSL will reduces crashing (and distorted animals/NPCs) but may also cause some distorting in TERRAIN, we will worry about that after crashing stops. Tell me if that stops the crashes -- if not then we will take a closer look at some other issues. You look to be using 64-bit JAVA already so that part is fine. My laptop is a lenovo Y570 and it does have a switchable graphics card. Thank you for your assistance in this. I am very excited to try this game. 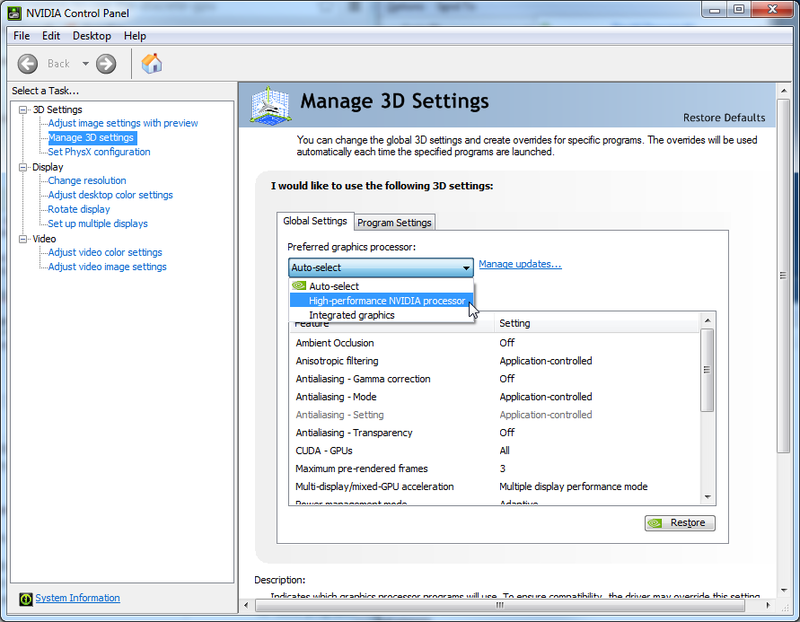 Ok that model has NVIDIA so we just need to check one checkbox and all will be ok, let me go look it up but it is in NVIDIA CONTROL PANEL > 3D settings > GLOBAL and says ALWAYS USE > HIGH PERFORMANCE. I''ll add an image in just a second. Easy to fix this one NOTE that this is going to increase battery usage on all programs. There is a way to tell it to use NVIDIA for JAVA games but the problem is the JAVA path changes every java update, so that is possible to do but its more of a hassle. Let me know though if that is important to you and we will walk through that alternative setting. The other option is to use "AUTO" mostr of the time but manually switch to NVIDIA any time you are getting crashes in JAVA games. If you have a SHORTCUT to WURM on desktop, you might be able to INSTEAD, right click the shortcut and direct it to use the HIGH PERFOMANCE Nvidia and not need to make any changes in control panel (guildwars in this example but I think WURM will work the same?). You can IGNORE all the other stuff in my first post about drivers/settings as that was for people with ONLY Intel. (I checked LENOVO support site but they have TERRIBLE driver support there, all their drivers are from 2011 or so, ewwww). Sometimes laptops with switchable graphics cannot update direct through NVIDIA but we will tackle that of it comes up. You probably have 2011 drivers (check Device Manager>Display>Nvidia>Properties>Driver Date and if they are 2011, you may need to update those anyway. that worked. Thanks so much for the assistance.